In commemoration of the 30th anniversary of the end of the 1984-1985 miners’ strike in the UK, the Mirror, a daily newspaper, recently published extracts from the diary of John Lowe, a miner who spent his entire working life in the industry, but who only became politicised during that famous coal industry dispute. Lowe was born in Whiston, Yorkshire, in 1931, spending his early childhood year there, and then in Danesmoor, Derbyshire. He left school at 14, and went to work at the Clay Cross Companies coking plant and then at the Parkhouse Colliery. In 1953, he married Elsie, and they would have two sons and three daughters. In the early 1960s, Lowe moved to work at the Rufford Colliery in Nottinghamshire, and a few years later moved to Clipstone Colliery. After 40 years a miner, 30 years of which were at the coalface, he was made redundant in 1987. Thereafter, he suffered from various physical ailments which restricted his mobility in retirement. He died in 2005. 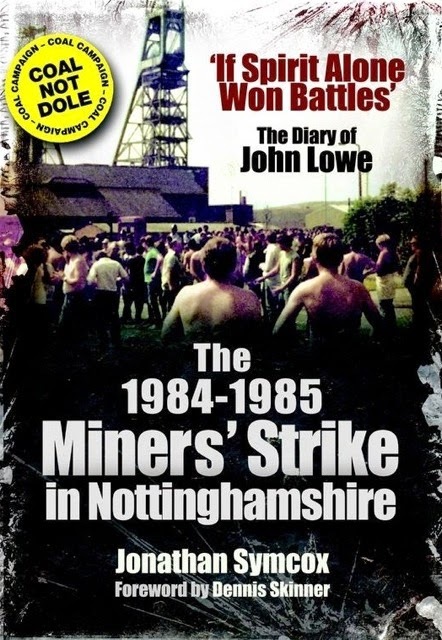 In 2011, Wharncliffe Books (part of Pen & Sword Books) published the diary of John Lowe as If Spirit Alone Won Battles: The 1984-1985 Miners’ Strike in Nottinghamshire. It was edited by Jonathan Symcox, Lowe’s grandson, with a foreword by Dennis Skinner, a well-known and outspoken left-wing Member of Parliament. Son of a miner himself, Skinner was a strong supporter of the National Union of Mineworkers strike, in 1984, against Prime Minister Thatcher’s plan to close coal mines. The stand-off between the Conservative government and the miners came to be dubbed as ‘the most bitter industrial dispute in British history’ - see Wikipedia. The following extracts are taken from the Mirror article, but further extracts from Lowe’s book can be found at the Miner’s Advice website. ‘Tried this afternoon to talk to some of the afternoon shift – as distasteful as it feels, it’s the only fresh tack left open to us. One of the lads talked for fifteen minutes and was really sick of it – he would only promise to think about rejoining us and to talk to his wife. If we could get two or three out again, it would really boost the lads; unfortunately it would take a bloody miracle. ‘Nationally, men are returning to work and this is very sad. They are not going back because the cause is wrong; after all this time the poor buggers are being forced back by all sorts of reasons: debt, a lack of money, food and fuel, and domestic and personal problems. Two of ours lost this week. The case of the Transits in Mansfield: our initial findings were a ‘scab van’ picking up in Pleasley and going on towards Clowne, and police patrol cars patrolling the supposedly closed office block near the dole office, which showed signs of activity with many lights on inside and three wire-mesh Transits still in the closed-off yard. We then found that the vans were certainly driving into Yorkshire and taking part in the ‘scab runs’ there, with police escorts all the way – but that Notts men were not taking part. Although few and far between, there are other published diaries by miners. Pen & Sword have published, for example, The Miners’ Strike Day by Day, the diary of Arthur Wakefield, and Yorkshire’s Flying Pickets based on the diary of Bruce Wilson, both edited by Brian Elliott.